Sometimes it can be difficult to hold your camera steady using just your bare hands. 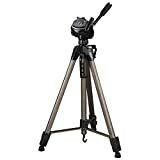 This tripod provides the perfect camera mount for photographic enthusiasts, comes with a quick-release plate and a 3D tilt head that allows you to capture pictures and videos from the perfect perspective. This entry was posted in Discount Photography and tagged Accessories, Aluminium, Champagne, Hama, Star, Tripod by Ball Photo. Bookmark the permalink.